Leading out-of-home media owner Clear Channel UK have today announced two new senior leadership positions: Chief Customer Officer and Chief Revenue Officer. Both roles have been created to help Clear Channel UK increase focus on delivering flexible, creative and accountable advertising solutions for customers. Chris Pelekanou will be stepping into the role of Chief Customer Officer, ensuring Clear Channel UK continues its track-record of inspiring, engaging and exciting new and existing customers. The expansive role will bring leadership across a diverse customer base that includes brands, SME advertisers, landlords and local authorities. The new role will also see Chris working with Clear Channel International, and its other business units, in order to help UK-headquartered multi-market advertisers benefit from Clear Channel Outdoors international scale. He will continue to oversee the UK Marketing, Direct Sales, Client Partnership and Creative Solutions teams. As Commercial Director, Chris has led the commercial team through a transformative and highly successful period, since joining in from The Guardian in 2012. Richard Bon will be stepping into the role of Chief Revenue Officer. He will be responsible for ensuring that Clear Channel UK achieves and surpasses revenue targets, through brilliant sales leadership and exemplary customer delivery. Richard has risen through the ranks at Clear Channel UK, having joined the marketing team over 18 years ago. Most recently, as UK Group Sales Director, Richard led his team to deliver in an outstanding revenue performance in 2017. Richard will continue to lead National Sales, Trading, Planning, Revenue Management and Ad Operations teams. Both roles will report directly to CEO Justin Cochrane. In addition to the newly generated roles, Mark Smith will now become UK Sales Director, leading the National Agency and Specialist Partner teams. He will continue to report to Richard Bon. 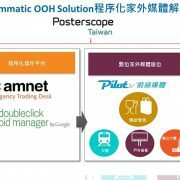 Can programmatic trading revolutionise OOH?